HIMSS19 Global Conference & Exhibition open next week, February 11-15, at the Orange County Convention Center in Orlando. HIMSS is the premier health information and technology conference, where professionals from around the world connect to find the latest vendor solutions. More than 45,000 attendees are expected from more than 90 countries. Another impressive statistic: there will be more than 1,300 exhibitors at the Orange County Convention Center. 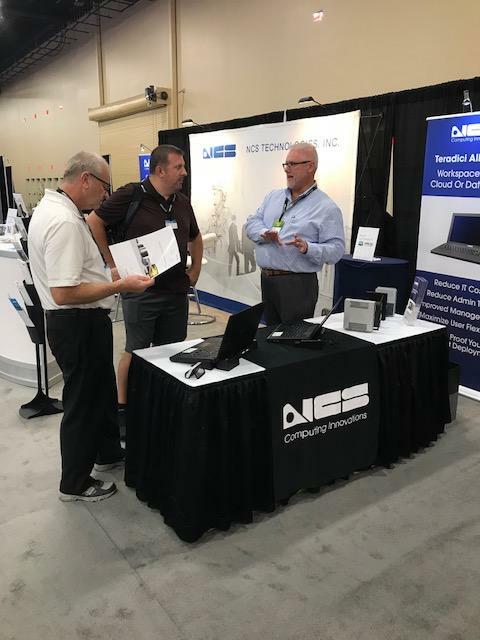 HEALTHCARE IT VIRTUALIZATION - Like every year at HIMSS, NCS will have on hand experts in desktop and server virtualization technologies, with branded products from both NCS and HP. HP 3D PRINTING SOLUTIONS - This year NCS has aggressively entered the 3D Printing Solutions market, through its partnership with HP. NCS sells and services the compact HP Jet Fusion 580/380 Color and HP Jet Fusion 4200 Printing Solution for industrial prototyping and final part production. HP ALL-IN-ONE HEALTHCARE EDITION - Optimize clinical workflows with the HP EliteOne 800 G4 Healthcare Edition All-in-One PC, engineered for easy sanitation and with optional integrated authentication and collaboration tools. Many NCS VDI mobile and desktop solutions are based on Teradici's PCoIP virtualization technology. With Teradici's All Access plans, you get a complete set of remote access solutions, enabling lower IT costs and reduced admin time while giving users maximum flexibility. All Access securely delivers workspaces and applications from the cloud or datacenter, as needed. Existing applications can easily be migrated, mobilizing your creative teams and leveraging the power of GPUs in the cloud. All Access allows the IT manager to manage, optimize and future proof any datacenter and zero client deployment. Datacenter elements and end points are always up to date, managed efficiently and supported by Teradici, the inventors of PCoIP technology. Infrastructure may easily evolve and scale, whether in the data center or the cloud. Teradici All Access subscribers get exclusive access to cloud access software, PCoIP Management Console Enterprise, firmware upgrades, resources and support. NCS has a comprehensive portfolio of the Zero Client desktops powered by PCoIP technology. At this event NCS will highlight its award-winning Cirrus LT Plus zero client notebook. The lightweight Cirrus LT Plus features a full 15.6-inch display, numeric keyboard, hot swappable batteries and many options, including proximity card reader. The company is well known for NCS Services, which include system integration, configuration, packaging, installation, and product warranty support capabilities. NCS is an authorized HP reseller delivering installation, warranty and training support services and applications expertise to maximize 3D printer performance, throughput, part quality and yield. Be ready for the next patient or user with HP's first AiO PC that is sanitizable with germicidal wipes every shift, every day, and is certified with EN 60601-1-2: 2015 for EMI safety. Free yourself from external devices with optional integrated dual-band RFID reader and FIPS 201-compliant fingerprint reader in an AiO that is Vidyo Ready and Skype for Business certified. Undecided about attending HIMSS19? We can keep you up to speed with our daily blog updates and our handy brochures. Download this HP 3D Printing solutions brochure.